There is perhaps no better online resource (or any resource) in the world on the New Apostolic Reformation than Church Watch Central. Their work is thorough. Their facts are impeccable. Their material is stellar. 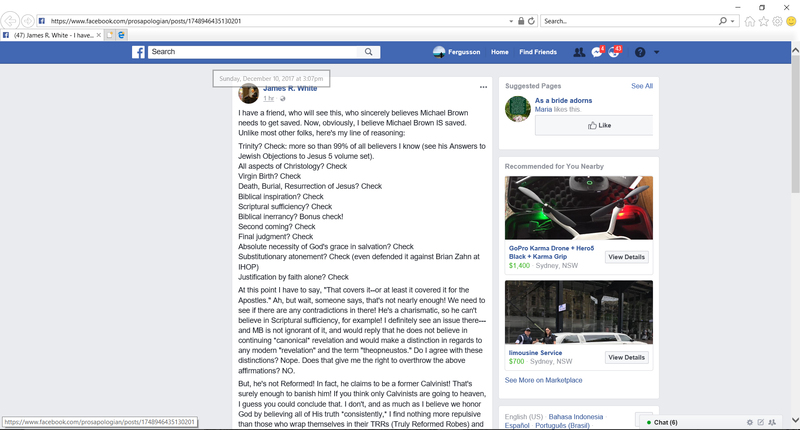 Church Watch Central took on James White for his decree of brotherhood upon Michael Brown, which is no less disturbing and theologically inconsistent than the now-infamous Elephant Room embrace of TD Jakes. James White should be ashamed of his support for charismania’s foremost apologist, and much more will be spoken about his support for Brown in coming days. This is shared in its entirety by permission from Church Watch Central. Dr Michael Brown might regret going on the air with Benny Hinn but he doesn’t apologize for his ongoing relationships and endorsement of his friends listed above. These aren’t some old endorsements, these are very current validations of these false ministries. Really Dr White? So do you. like Brown, declare that Jesus gave up His divinity to become fully man so you, just like Jesus, can do miracles under the power of the Holy Spirit? (This is the false kenotic Christ which Brown believes.) This is the false NAR Christ Michael Brown confesses, espousing the typical NAR cult-litany that comes with the territory. Next story Theologian Calls out Gospel Coalition/ Joe Carter for Hypocrisy on Attacking Roy Moore But Celebrating MLK Jr.